Post forum reception by The Freedom Cafe, sponsored by UMass Department of Legal Studies. Lauren Mc Carthy and audience members. Post forum reception and discussion with audience members. The UMASS performance of Cuatro Corridos on October 4, 2015 was supported by an ARTWORKS grant from the National Endowment for the Arts and the Department of Music at UMASS Amherst. The eleventh performance of the critically acclaimed chamber opera was preceded by a panel discussion, The Reality of Human Trafficking. Lauren McCarthy, UMASS Amherst Assistant Professor of Legal Studies and author of the recent book Trafficking Justice, served as moderator. Panelists included Julie A. Dahlstrom, Clinical Legal Fellow at Boston University, Quinn Kepes, Program Director at Verité, an organization dedicated to fair labor practices worldwide, and Dan Johnson from Freedom Cafe, a student run cafe that supports anti-trafficking efforts from proceeds of its sales. 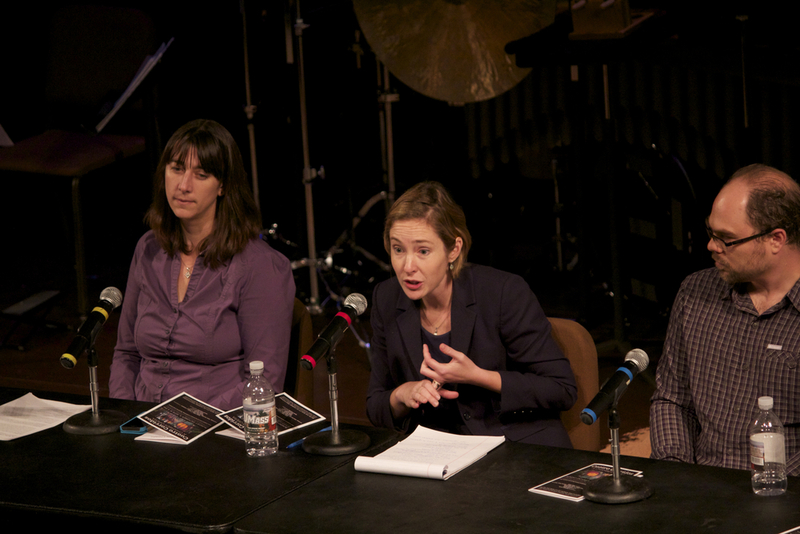 The 2 p.m. panel discussion was free and open to the public.